Once upon a time there was the sweetest little Niece who used to follow her Auntie around the garden full of wonder and curiosity. Her Auntie could see even then that one day her Niece would have a garden of her very own. The Niece soon grew up. Her love of gardening continued. She even attended Chicago's agricultural high school and became valedictorian of her graduating class. 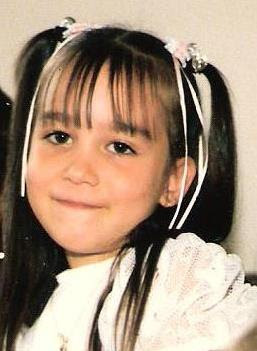 She became a beautiful young woman with a generous, kind, loving heart. Off to college she went. Before we knew it, she'd graduated, and one day awhile later, she married her college sweetheart, a young man who'd grown up on a farm not too far away from her own great-great grandparents' farm, then studied horticulture in college, and soon embarked upon his horticultural career. And one fine day a few weeks ago, the Niece and her husband welcomed a new little gardener into the family, Ms. Liliana Lee. Our new little gardener had a bit of a rough start in life. 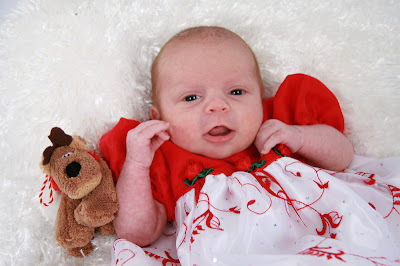 Having been born a few weeks early, her lungs weren't quite ready and she had a hard time breathing. The Niece and her husband had to leave her in the hospital for a while until her lungs were more mature and she was able to breathe and eat on her own. Thankfully our new little gardener is doing wonderfully well, and was able to come home to celebrate her first Christmas with her grateful parents. And the Niece, her husband, and the new little gardener lived happily ever after, growing and blooming in a garden of their very own. 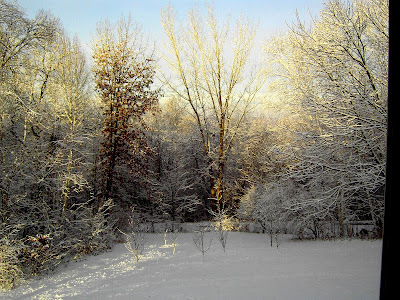 My youngest daughter and grandson moved back to the east coast earlier this year and will be spending Christmas there. My stepdaughters are spending Christmas together in sunny California. 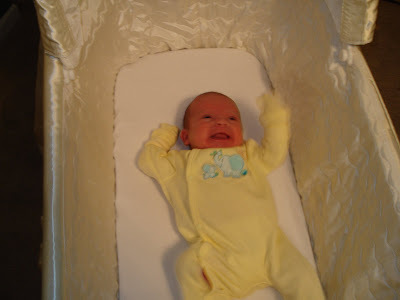 And my niece and her husband will be at home a couple of states west of here, enjoying their brand new baby girl. We'll miss them all this Christmas. Together or apart, we're glad they're all warm and safe at their Christmas destinations, whether snowed in at home or visiting other family members, not sleeping at the airport or trying to drive long distances in the sleet, snow and ice we've experienced in wave after wave this cold midwest December. We're looking forward to celebrating tomorrow with the Lawn Man's mother and sister and my oldest two daughters with their significant others. The Lawn Man is planning a feast of ginormous proportions. His holiday dinners are legendary, and this Christmas will be no exception. I've been working on some baked goodies and appetizers, and we'll be doing lots of prep work today getting ready for tomorrow's celebration. Wherever your loved ones are geographically, may you all enjoy a safe, peaceful, and Very Merry Christmas! It's been hectic lately, and I've taken a blogging break the past few weeks. I'm happy to be back for Bloom Day, and even have a few December blooms to show off.
. . . like this light peach geranium blooming in the basement. Last year I tried to root some geranium cuttings, but none of them survived. Recently I tried again, and much to my delight the three cuttings I took, one from each of three different colored geraniums, have all rooted and are growing happily. I didn't do anything differently this time. Sometimes persistence pays off. This hydrangea cutting rooted easily and is thriving in the basement, even blooming already! It's either Endless Summer or Nikk0 Blue, I'm not sure. In the basement under artificial light, the blooms are very pale, mostly white with just the slightest bit of pink. The first bloom on this same plant was pale blue, but that was in the fall when it was still outside. I have three different kinds of hydrangeas started from cuttings this fall - this one, and several cuttings of Annabelle and Endless Summer. The cuttings are compliments of the nursery and two of my clients. Three Endless Summer cuttings, if they make it through the winter, are being grown for the client who so graciously shared them with me. My fingers are crossed that they'll make it until Spring when I can move them outside. The cuttings, all started in October, seemed too immature to plant outside this fall. I've read it's difficult to keep hydrangea starts inside over the winter. Has anyone had luck with this? Last year I brought the the purple oxalis inside for the winter in the same containers they'd been growing in all summer. They went dormant almost as soon as I brought them in. This year right before bringing them in, I transplanted them all into the same container and they have grown and bloomed nicely. From what I've read disturbing them will often trigger dormancy. Go figure! Mexican Heather is blooming happily in the basement. The blooms look bluer than this, but the sodium grow light in the basement distorts color. The lighter pink double impatiens have bloomed nonstop since coming in for the winter, in spite of the fact that I pulled off all the blooms and buds before bringing them in. They were budding and blooming again within a week or two. Dragon Wing begonias are in the living room and have also been blooming nonstop since coming inside. This month the blooms have more color than last month, although they're still paler than they were outside during the summer. This is a bright pink geranium blooming in the basement, another one I successfully started from a cutting. This dark pink double impatiens is blooming in the basement too. Last month on bloom day I had jasmine buds but no blooms yet. The jasmine has bloomed all month until the last few days, and now we have buds again. This plant has really taken off since coming inside for the winter, after a year of very slow growth. It's going all over the place and I really should prune it. But that would mean removing buds. That's not going to happen anytime soon. Their gorgeous fragrance is food for the gardener's soul in December. Ok, I know they're not blooms, but the caladiums are just so darned pretty they made the cut for December Bloom Day anyway. I needed the blogging break, but it's good to be back. I've missed you all! For more Garden Bloggers' Bloom Day posts, please visit Carol, the creator and hostess of Bloom Day, at May Dreams Gardens. Peace out to you and your Dear Ones. On Sunday Mr. McGregor's Daughter did a book meme, and I thought it would be fun to play on this cold November morning. I'm scheduled to work at the greenhouse, but just got a call that instead of starting at 10:00, I can come in at 1:00. Happy Days! It's cold and windy out there this morning and I'm more than happy to do my part helping keep payroll dollars to a minimum! Because it was late afternoon - chore and milking time - they were restive; but because they weren't working and their stomachs were full, in a warm room, they should be sleeping, and they blinked, yawned, and grimaced to keep their eyes open. The farm women, nearly starved for anything resembling higher culture, demanded more from the occasion than it could possibly yield. With eyes as white as freshly peeled hard-boiled eggs they inspected the jewelry, hair, and clothes of the other women, tasted each morsel of food disapprovingly, strained to hear conversations from neighboring tables, worried about wrinkles in their faces, and frowned at their husbands to sit up straighter in their chairs. . .
Ah, to be included at the table of people whose backs did not ache and feet were not swollen, whose nurtured capacity for merriment so exceeded all unpleasantness that the bass notes of living could be blithely ignored. This was the real human technology that from time immemorial had driven small farmers off their land and muted the howl of those caught in the gears. In the scramble to secure a place at the banquet - at least for their children - the cries of those run over by the Engine of Progress could scarcely be heard. While visiting M&M who live in the Driftless region of southwestern Wisconsin, we attended an open house at the small potato farm of friends of theirs. One of the other guests I met was David Rhodes' wife. David was recently interviewed on NPR's "On Point." You can listen to the interview here. I've quoted the written introduction to the interview below. It's a succinct biography and history of his latest work. 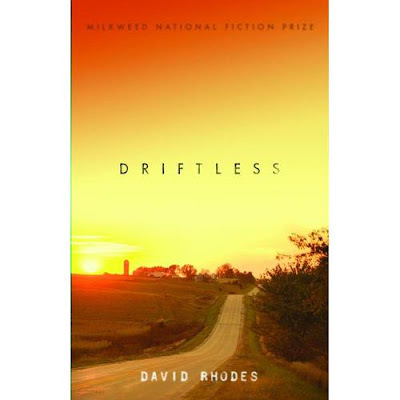 Writer David Rhodes published three novels still in his twenties, was hailed as one of the best of his generation, was paralyzed in a flash, in a motorcycle accident, and dropped off the map for thirty years — living simply, quietly, almost invisibly in the rolling countryside of rural Wisconsin. Three years ago, a young fan tracked him down. Discovered he was still writing. And brought him back. His extraordinary new novel, Driftless, takes us deep into the lives and hollows of the world he has quietly observed, off the map, for decades. I was intrigued upon hearing about David and his new book at the open house. Then Mom sent me a link to the interview. Having frequently visited the Driftless Region, I was naturally very interested in the book and even more interested after listening to the NPR interview. I thought it would be an excellent read this winter, so I ordered the book from Amazon and have not been disappointed. I'm still in the middle of it, and am looking forward to reading Rock Island Line, David's last novel which I also got from Amazon, next. Bugbane has the distinction of being 2008's latest bloomer in our garden. This is the lone bloom left outside this November, and there are four of them on this plant. Last year the buds languished after the first frost, never opening. The rest of the blooms in this post were rescued from certain death and brought in to sunny windows in our living room and dining room, or placed under our sodium light in the basement greenhouse. A pink pelargonium overwintering in the basement greenhouse. The ever-present double impatiens, now safely overwintering in the basement, awaiting cuttings. A Christmas Cactus cutting overwintering in the basement. I think it deserves a more prominent spot now that it's blooming. Time to bring it upstairs. The sodium light in the basement distorts colors. This is a peach-colored geranium, (pelargonium,) rescued at the last minute along with two other pelargoniums I forgot about until last week. The dragon wing begonias buds and blooms have become much paler since coming in from outside. This one is in our south living room window. A Sambac jasmine is happily overwintering and budding in the basement greenhouse. Last year there were two, but one expired over the winter. I hope the last one standing makes it through the winter. Basil blooms in the basement greenhouse. I'm hoping for some seeds for next year, and have hand-pollinated these blooms. Heliotrope overwintering and blooming in the basement greenhouse. Dragon Wing begonia in the south-facing living room window. Since coming inside, the blooms have faded to a much lighter, pinker shade. Most of the datura buds dropped off after coming inside, but this lone bud decided to grace our living room with its color and fragrance. The datura is a double. I manually pollinated the bloom and am hoping for some seeds. Only time will tell. Definitely not blooming, next year's veggie bed has added a second layer of pavers and several alternating layers of autumn leaves, grass clippings, and all different kinds of compost. November's gloomy skies, although not blooms, are beautiful in their own right. For more November blooms, please visit the hostess with the mostest, Carol at May Dreams Gardens. Finally! I haven't had a veggie garden since moving in with my dear husband five years ago. Thirty-two years ago when my oldest daughter was only 6 weeks old, she, her dad, and I moved to our first house, a spacious three-bedroom vintage home with the remains of a small orchard on what had once been a small farm, just across the street from our tiny one-bedroom apartment. We must have been quite a sight carting all our worldly belongings through the parking lot of our apartment building and across the street to our new home. The previous renters of the house had planted the two wide strips of soil along the length of the driveway with all kinds of veggies. Since we moved in September, there were lots of veggies left to harvest. I'd grown up with a vegetable garden. After living in an apartment for a little over a year, I was thrilled at the prospect of having one of my very own. Since the beds were already prepared and planted, all that was left was to enjoy our free harvest, order some seeds, and plant more vegetables the following spring. A couple of years later, I moved the garden into the backyard and planted ornamental borders and some lawn along the driveway. My daughters grew up with fresh, organic veggies from our garden. They learned to like quite a few more vegetables than they otherwise might have. It was fun for them to pick their own veggies, brush off the dirt, and eat them still warm from the sun. The Middle One would only eat broccoli if she could pick it herself. She called the florets trees. In her booster seat at our dinner table, she wouldn't touch broccoli, but she'd stop in the middle of playing in the backyard to snap off a tender "tree" and pop it in her mouth. The kids were always welcome in the garden, just as I'd been when I was a child. I've been yearning for a vegetable garden since the first year I was here. All my resources the first five years, including time and energy, were spent on the unplanted perennial garden that occupies about a third of our backyard. Then there was the question of where I could even have a veggie garden, since most of our yard is very shady. There's not one spot of full sun in the back yard. This is wonderful on hot summer days, and our back yard and patio are a cool, shady, mostly-private oasis, but not so great for a vegetable garden. Even the patio is too shaded to grow them in containers. Then of course, there's my dear husband. I think I'll call him the Lawn Man for the purpose of the blog. He makes lawn care an art and a science in its own right, and has even figured out what kind of grass will grow in the heavily-dappled shade of the back yard where it competes with the shallow roots of three mature silver maples. Most of our neighbors have professional lawn care, but we have the nicest lawn on the block, if I do say so myself. Our beautiful lawn makes a lush, green backdrop for the perennials, annuals, and mature trees and shrubs that surround it. The cool, soft grass feels wonderful on bare feet. We make a good pair - the Lawn Man and the Garden Girl. He takes care of the lawn, I take care of the garden, and we both pitch in with the many high-maintenance mature shrubs and hedges. Anyway, last year he offered to sacrifice some prime lawn real estate in our sunny side yard to the cause of my yearned-for veggie bed. Knowing how much he loves the lawn, I'm not exaggerating when I say it is a sacrifice. This fall, I took him up on his offer, and you can see the result above. But wait, it's not quite finished. That means you'll be hearing more about it as I complete it. I couldn't exactly be advocating for a veggie garden on the White House Lawn without doing my part for the cause, now could I? Although its late fall and I have several months to pass before planting the garden, don't be surprised if you hear even more about it over the winter. I'm very excited. There is no more important resource for changing the direction of this country and defining the ideas that will transform America than the American People. Tell us your ideas and be part of the change you're looking for. From CHANGE.GOV, the website of the Office of the President-Elect. Could our collective voices influence public policy in our new administration? Could Michael Pollan's Farmer in Chief proposal be implemented in whole or in part by our new administration? Would it be audacious to hope we, the garden blogging community could, with our voices and collective passion for our environment influence our new administration's farm policy, gardening in schools, support of Victory Gardens, promotion of urban vegetable gardening and local food sources, and other vital issues? post script: If you haven't yet signed the petion to President Elect Barack Obama to grow an organic vegetable garden for his family on the White House grounds, with surplus produce shared with local food pantries, please visit Eat the View. Please sign the Organic Consumer Association's petition letter to President-Elect Barack Obama today and urge him to take a stand in support of organic food and farming. After you sign this petition, please forward it to everyone you know. Please visit OCA. Two geraniums (ok, pelargoniums,) left outside - this pink and a peach. The clock is ticking. . . still deciding. I overwintered them in the basement greenhouse last year. Should I or shouldn't I bring them in? Rozanne has bloomed since I brought her home this spring to replace the ones I killed trying to divide them last year. I killed two of them, so I this spring I bought four. I know she can be successfully divided, but I'm not taking any chances. I'll either figure out another way to propagate them, or I'll just buy more if I want them. The calamint still has a few blooms left. Even with not much sun it's bloomed all summer. There were two of them last year, but one didn't make through the winter. I hope this one lives to bloom again. Two Susans are all that are left, with lots of seed heads for the critters still. I'm not at all sure this pretty oxalis will survive the winter. Fingers are crossed. Frost got the bugbane before it bloomed last year. If not for the late frost this year the buds would never have opened. I thought about cutting them and bringing them in one evening when predicted frost didn't materialize here. I may do that still, but I'm glad I took a chance and got to see it bloom in the garden. 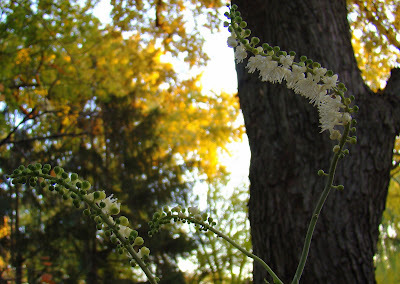 A closer look at the bugbane blooms. I'm sure all these blooms will be toast by bloom day. We are definitely on borrowed time with our glorious November summer, so I seized the moment and captured them while I still can. We've had such a beautiful fall! There have been some cold days here and there, but overall so far, the weather this fall has been fabulous. We haven't even had a frost yet. I've been enjoying seeing the hostas develop their lovely fall color instead of frost turning them to mush while they're still green . Had may be the operative word here, as this is probably the last day of Indian Summer. Tomorrow we may be heading into typical chilly, windy, wet overcast Chicago November - the cloudiest month of the year here. In the meantime I'm enjoying every possible moment outside enjoying the waning moments of the gardening season. There are still a few stalwart Susans blooming. The serviceberry is almost bare, but the color of the remaining leaves is lovely. It was especially pretty this fall. Color is everywhere. This is a peak over the hedge into a neighbor's yard. The hostas are yellower and yellower every day. The maple in our front parkway is just about at peak. It won't be long before it's branches are bare. Across the street this maple is glowing in another neighbor's yard. All the containers have been emptied or brought in except this one. I selectively plucked out more tender plants - sweet potato vines and coleus were looking pretty sad. What's left is past its peak, but I left it to help minimize our summer withdrawal symptoms. Soon these irises will be the only blooms left in the garden.